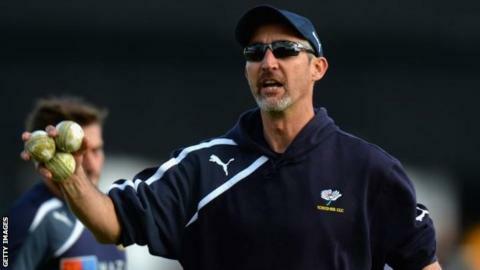 Yorkshire coach Jason Gillespie has warned his players to remain focused as they close in on retaining their County Championship Division One title. Gillespie's side will be champions for the second year in a row if they gain six points from their game at Middlesex, which begins on Wednesday. "With all the media speculation there's a buzz around and a bit of excitement," Gillespie told BBC Radio Sheffield. "It's difficult for them not to get excited but they have to be focused." He added: "Whatever we do on day one, bat or bowl, we need to do that to the best of our abilities. "Everyone is excited and they've earned that right to be excited. We've put ourselves in a really good position but we can't take anything for granted." Yorkshire are 43 points ahead of second-placed Middlesex and have one game in hand with three matches of the season left. They could go through the Championship campaign unbeaten, but Gillespie says he is not concerned about that. "I've not thought about it and I won't until the last ball of the season has been bowled," added Gillespie. "We have a very clear plan of how we want to go about things and what we expect of them."